Ozhotels provides business and leisure travellers with a directory of independently owned and non-related hotels and serviced apartments providing accommodation in Dandenong, Melbourne. Oz hotels allows you to deal directly with the hotels and apartments in Dandenong, hence giving you the best possible rates for this luxury and budget Dandenong accommodation. Book your accommodation online directly with the hotels in Dandenong, Melbourne and receive discount rates for longer stays !!! Dandenong is an adaptation of an Aboriginal word meaning lofty mountains and refers to the Dandenong ranges which overlook the area. The suburb of Dandenong is situated 31 kilometres southeast of the Melbourne city centre along the South Eastern / Monash Freeway. Dandenong is commonly known as the 'Gateway to Gippsland' and also provides easy access to the Mornington Peninsular, Phillip Island and of course the Dandenong Ranges National Park. The Dandenong goods and produce market was established at its present city centre site in 1927 and each Tuesday hosts market day. 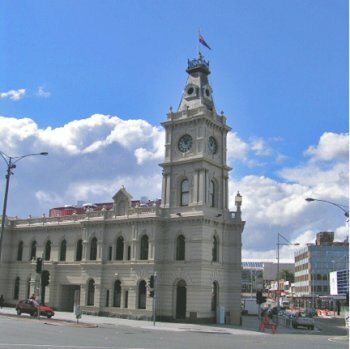 It remains an important feature of the City as does the impressive Dandenong Town Hall which was built in 1890. The Dandenong town centre attracts shoppers from the country to its large retail complex, has a large hospital, TAFE college and an extensive transport network, with a busy railway station and bus interchange servicing the area. Ideally positioned at the foothills of Mount Dandenong and in one of Victoria's fastest growing manufacturing and commercial areas the Chifley Doveton Hotel provides corporate and leisure guests with luxury hotel accommodation in Dandenong. This quality hotel is just 5 minutes from the Dandenong CBD, at the junction of the Princes Highway and South Gippsland Freeway, which gives guests easy access to all areas of Melbourne. 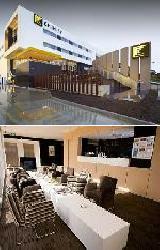 The 128 stylish hotel rooms at the Chifley Hotel Doveton are all non smoking and seemlessly blend contemporary design with the comfort of a true home away from home. 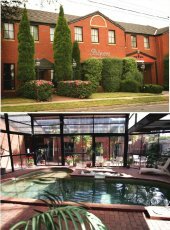 The Chifley Hotel Doveton offers a range of modern on-site facilities including 24 hour reception, heated indoor swimming pool, fully equipped gymnasium, spa, sauna, guest laundry, business centre with internet access, room service and free car parking. The Ramada Encore Dandenong opened in 2005 and has set a new standard in quality hotel accommodation in Dandenong. This four star hotel has a unique blend of contemporary design, friendly hospitality and vibrant atmosphere. 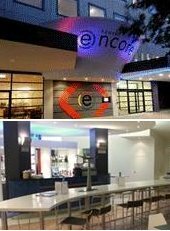 The Ramada Encore Hotel Dandenong is ideal for the discerning business or leisure traveller with discount rates and exceptional service that will ensure that your accommodation in Dandenong is a truly memorable one. Ramada Encore Hotel prides itself on providing guests with complimentary secure undercover parking, in-room internet access and wireless high speed connectivity to all public areas as well as in-room tea and coffee making facilities. 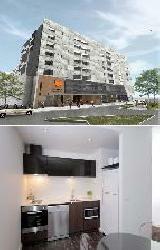 Punthill Dandenong is situated on Lonsdale Street in the heart of the Dandenong CBD. Dandenong is one of the fastest growing commercial and manufacturing centres in Victoria and is located 30 kilometres south-east of the Melbourne CBD. The stylish and modern Dandenong accommodation provided by the Punt Hill Apartments consists of studio hotel rooms and more spacious 1 & 2 bedroom fully self contained apartments. All of the guest accommodation rooms provide air conditioning & heating, high speed internet, business work station, LCD TV with Foxtel & DVD player, ensuite bathroom and kitchen facilities. At the Punthill Dandenong there is also a wide range of hotel facilities to suit the business and leisure traveller including conference facilities, gymnasium, cafe, business centre, luggage storage, restaurant, guest laundry, spa, barbecue grills, daily housekeeping and free on-site car parking. The Quest Dandenong Serviced Apartments provides quality studio, 1 and 2 bedroom self contained apartments just a short stroll to shops, al fresco cafes, restaurants, bars, markets and food halls in the heart of Dandenong. A great alternative to hotel accommodation the Quest Dandenong Apartments is ideally located for those conducting business in the outer South Eastern suburbs of Melbourne including Clayton, Mulgrave, Springvale, Dandenong, Noble Park, Pakenham, Hallam and Narre Warren. The Quest Dandenong is close to the Drum Theatre, Dandenong shopping centre, Sandown Race Course and the Dandenong market. This value for money Dandenong accommodation also provides a base from which to visit Frankston, the Dandenong Ranges, Puffing Billy Steam train, Mornington Peninsula and Philip Island Penguin Parade. The spacious, non smoking studio, 1 and 2 bedroom refurbished apartments include a fully equipped modern kitchen, private laundry and a spacious living area. The Quest on Dandenong Apartments provides exceptional guest services including 24 hour onsite manager, free car parking, swimming pool, BBQ facilities, landscaped gardens, security access, restaurant chargeback, tour desk and extensive business services. The wide variety of accommodation available at the Comfort Inn Dandenong ranges from Standard Suites right through to luxury Family and Spa Suites. From the moment you arrive at this 4 star Dandenong accommodation you will notice that it offers the facilities and versatility to be the perfect home away from home for the most discerning traveller. The Comfort Inn Dandenong offers something for everyone with Free off street car parking, 24 Hour reception, the Princes licensed restaurant, Cocktail Bar, Poolside beer garden, Function & Conference facilities, Indoor heated pool/spa, Sauna and Gymnasium. 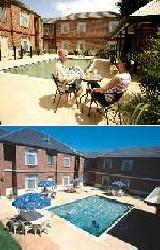 Quality Dandenong hotel accommodation at very reasonable discount rates.